Today we are going to prepare everything for sewing next week which includes printing, choosing a size, making adjustments, cutting out your fabric, and transferring markings. 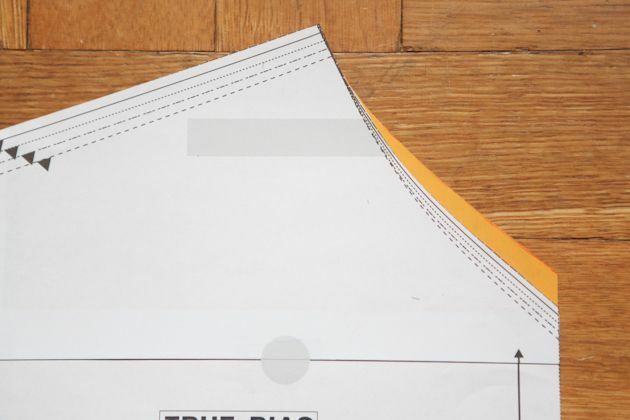 I am not going to go too in depth with how to print out your pdf, but if you need more pictures and help click here for when I went over it more thoroughly for the Hudson Pant Sewalong. Just make sure that your printer settings are set up to print at 100% with all scaling turned off. 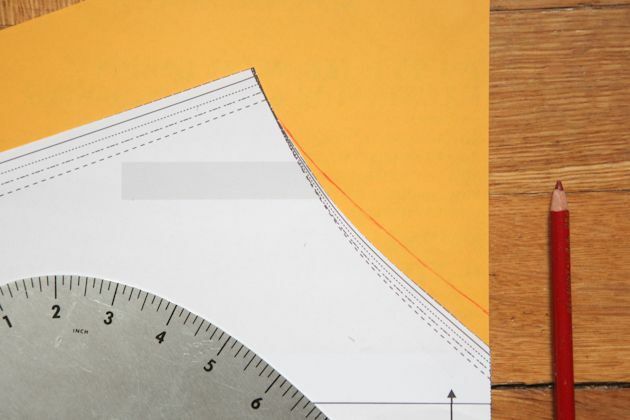 Print the first page of your pattern first and measure the 2 x 2 inch square to make sure that you are printing correctly before you print the remaining pages. The Sutton Blouse is intentionally loose fitting. The hip has about 5.5 inches overall ease and the waist has almost 10 inches overall ease (it’s only slightly less than boxy). The chest has 11.5 inches of ease, but this is misleading as the bust line runs into the kimono sleeve meaning that some of the with of the sleeve is in there too. If you are between sizes or want your blouse slightly more fitted I recommend going down a size. Some of my testers were different sizes in the bust / waist / hip. They had good results just cutting out the size of their bust and relying on the ease of the rest of the garment to take care of the differences. That is up to you and the amount of the difference. If you want you can also grade between sizes. 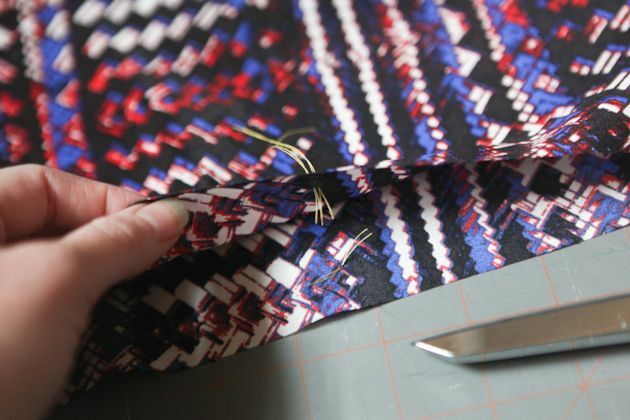 The pattern pieces are all stacked in a manner that should make it really easy to do so. I draft for a model that is approximately 5’5″. If you are significantly taller or shorter than that you might want to consider lengthening or shortening your blouse. It’s really easy to do. First I will show you how to lengthen it. 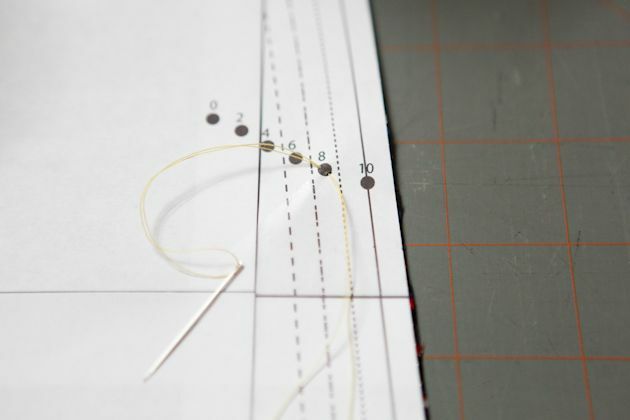 Start by cutting your pattern piece along the lengthen or shorten here line. 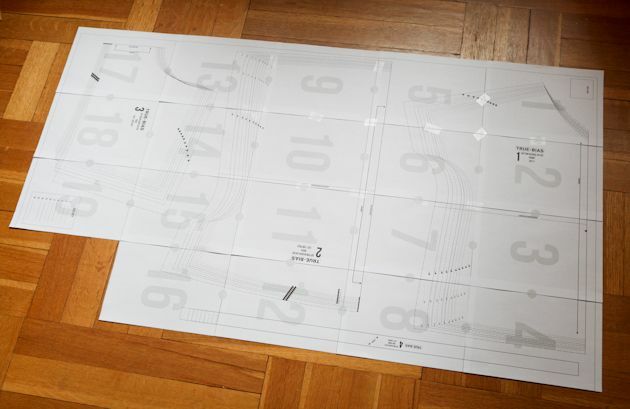 Grab a piece of paper and put it behind your pattern. 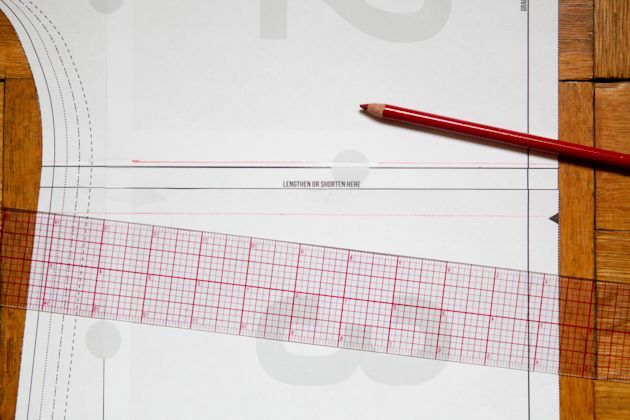 Using a ruler separate your pattern the amount of length that you want to add to your pattern. Make sure that it is even all the way across and lined up along the grainline, fold line, or center front line. Tape in place. Connect the side edge. 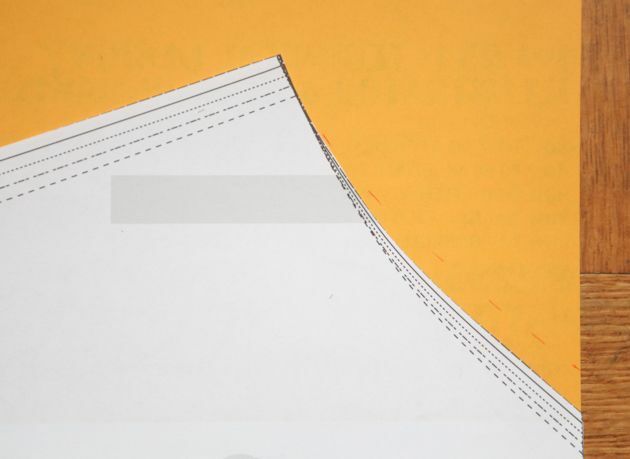 You may need to trim a little off of the pattern above and below the added amount to make the edge connect in a pleasing manner. That is fine. 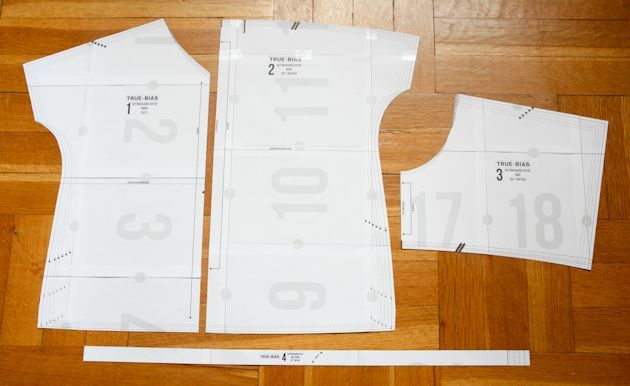 Cut away the excess and your pattern is ready to go. Make sure that you do the same thing (and open the same amount) on both the back and front. Shortening your blouse is essentially the same but in reverse. Start by distributing the amount the you want taken away evenly on top and below your lengthen or shorten here line. 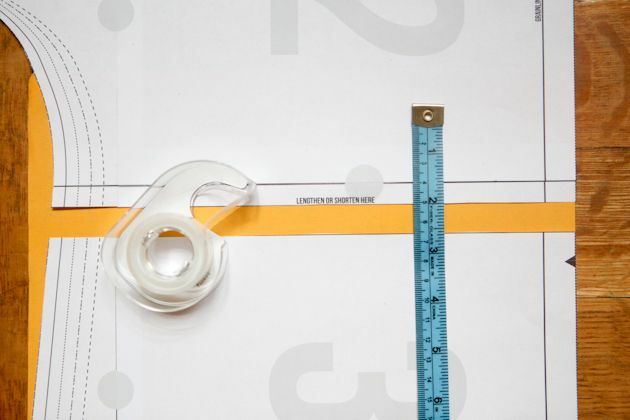 For instance, if you want to shorten 1″ then mark a line 1/2″ above and below the line. 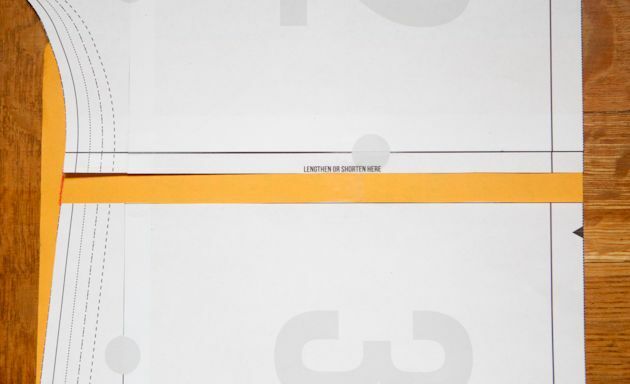 You can either cut along those new lines and then tape back together or just fold those two lines together and tape down. Just like before you will need to redraw the small portion of side seam affected by the adjustment so that it’s pleasing and gradual. This may include shaving off a small portion of the side seam. Necklines can be very subjective. I find that I like a deep V, especially when paired with large sweaters and jackets because it makes me feel less buttoned up. But, I totally understand wanting to feel a little more comfortable in something with a slightly higher V. If you want to shorten your V neck you can follow these simple steps. I am showing you how to raise it, but the same would apply to lowering it. Mark up (or down) the desired amount along the center front line. (I am raising the neckline by 1/2″ here.) Starting at the top left, follow the original curve for about an inch so that it connects to the yoke at the correct angle. 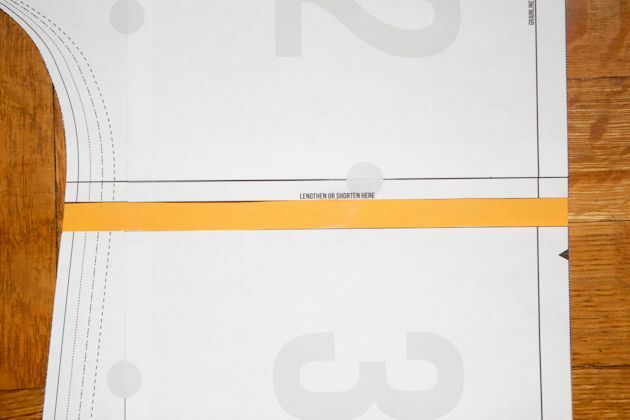 Then gradually separate it from the original line until it reaches the new marking on the center front line at a pleasing angle. Connect the dots, and cut out your new neckline. 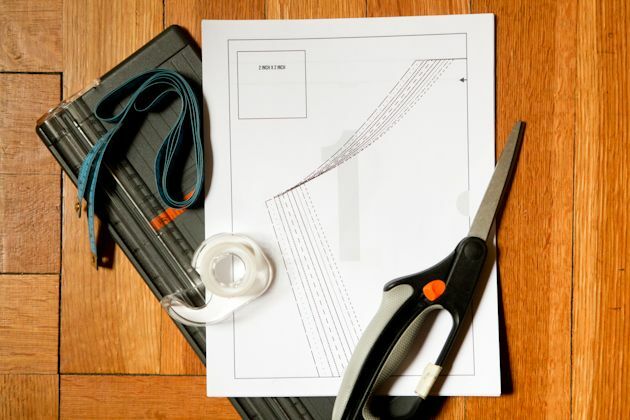 Now cut out all of your pattern pieces. 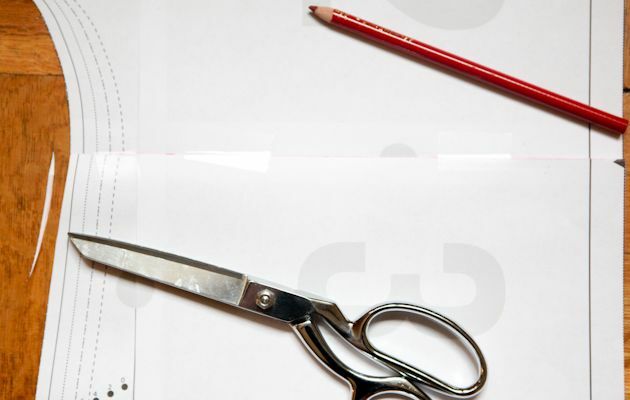 Once that is done it’s time to cut out your fabric. 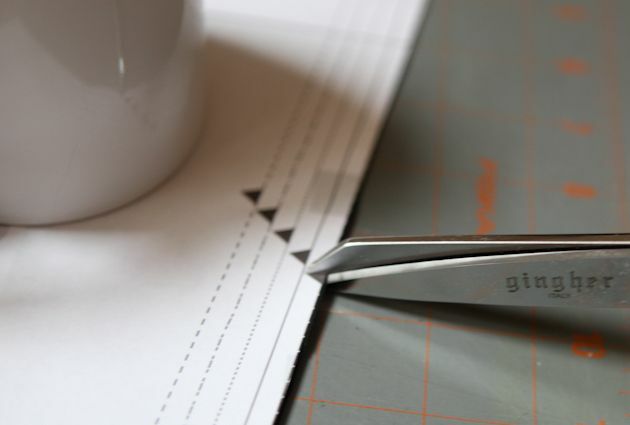 Because some of these fabrics can be a bit slippery you may want to take some extra care when cutting them out. For me I like to use my rotary cutter and “pattern weights” (one day I will get real ones :). 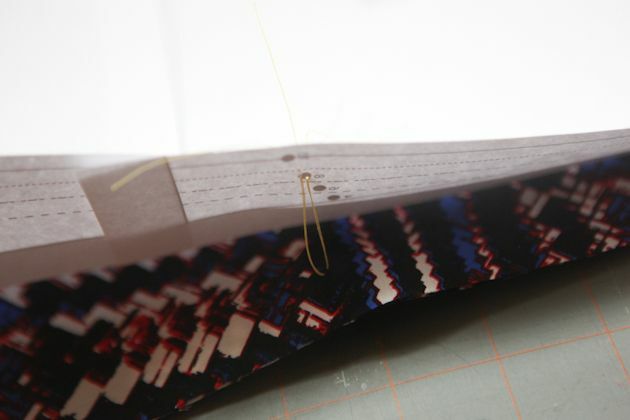 But if you want to try some other ways to cut out slippery fabrics check out this and this. The last thing that we need to do today is transfer all of your markings. 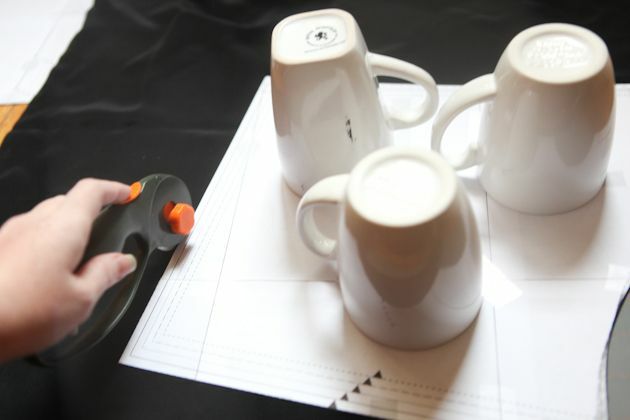 There are triangle notches and circles that need to be marked. For the circles I recommend using a tailor’s tack. You will need some contrasting thread and a sewing needle for this. Thread the needle so that the thread is doubled up and 6 – 10 inches long once doubled. Insert the needle into one side of the circle and through all layers of fabric. Pull it back through the other side of the circle (the stitch should only be about 1/8″ total) so that it is exiting back through the pattern. Clip the thread near the needle so that the needle is no longer attached and make sure that there is about a 3″ tail on both sides of the stitch. 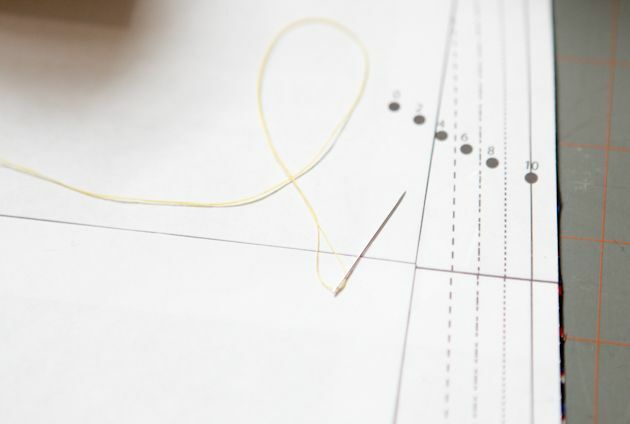 Once all tailors tacks are made on a pattern piece then carefully remove the pattern from the fabric while keeping the stitch in place. Now carefully pull the two fabric pieces apart about an inch and clip in between so that there is a marking on both pieces of fabric. That’s it! Now we are all ready to start sewing. 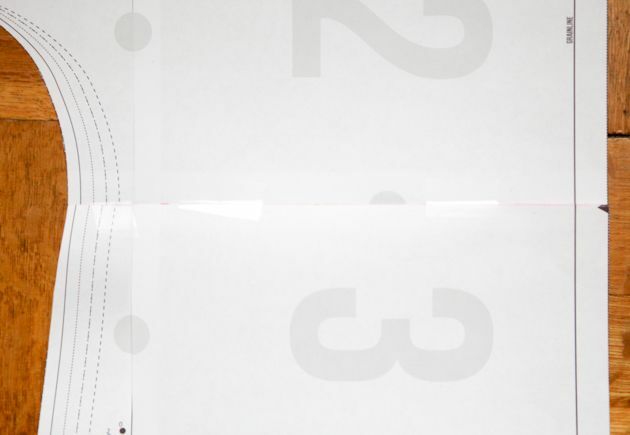 I might have overlooked the information, but is this seam-allowance included in the pattern? Hi, I don’t get the full half circle on each side when I printed out the pattern, the half circle making up the full circle when pieced together. My tester square measures 2 inches so not sure how to correct the half circle issue. It’s hard to work out where to piece the pattern together as a result . Any ideas?